The preferred method for presentation of your artwork is high-resolution pdf in CMYK format and with all fonts embedded. 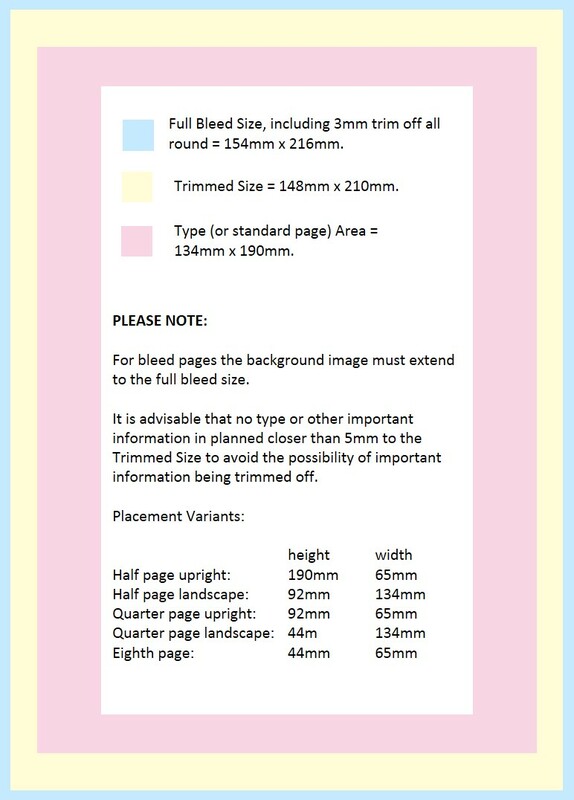 If you are unable to supply pdf: In order for us to output correctly please supply a colour proof for advertisements, all graphic files (300dpi and CMYK colour) all fonts used, to be deleted once your advertisement is published. Unfortunately we cannot accept Pagemaker, Claris, Microsoft Word, Powerpoint or Publisher files. Preview images embedded in Word or Powerpoint are unacceptable. Delivery: Once your advertisement is ready you can supply it via the following media: Electronic transfer i.e. pdf, jpeg or tiff attached to email. Ink Type: European/British Standard ink 4666.